The Vietnam International Exhibition on Film and Television Technology (Telefilm) will be held from July 13 to July 15 in Hanoi. The exhibition aims to step-by-step, and officially, set up a transaction exchange centre for films and TV content and technologies of the highest quality, as a place focussing on qualified TV stations and units in the region. “The exhibition will create favourable conditions for domestic and foreign television stations to display their products, while seeking an opportunity to exchange views and cooperation with each other, particularly in helping local television managers and producers to learn on-the-spot about film making processes and production in the most professional manner,” Adpex JSC, an organiser of the exhibition, said. More than 200 companies, TV stations and units from 15 countries and territories including the United States, Germany, Japan, and the Republic of Korea (RoK), in addition to India, Turkey, mainland China, and Hong Kong, among others, have registered to open 350 stands to display their items. The event has also attracted producers nationwide including Cat Tien Sa, BHD, TNS, and Lasta, apart from Song Vang, ADT, Sunrise, Viet com and Dolphin. 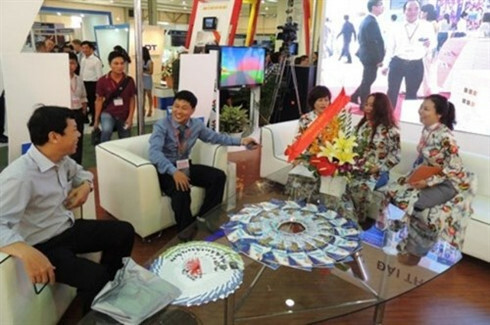 A number of seminars, on new technologies in producing TV programmes, roles and effects of the social media on TV industry, and copyright protection, will be held during the three-day exhibition at the International Centre for Exhibition in Hanoi.